She couldn’t have vegetables of her own. Photo courtesy of Ben Fabrislane. 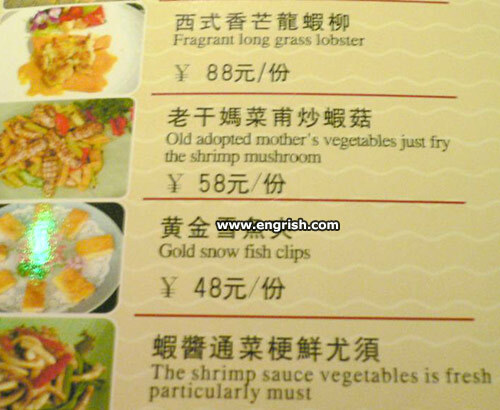 Gold snow fish clips… some kind of pee tapes from Norway? Looks a bit rich… can I just have some wet sprocket on toad, please ? They all want old adopted mother’s vegetables but nobody wants tomater. A bit like a shower when your riding a bike. It’s easy to adopt a child. But, HTF do you adopt a mother. Star student jailed after murdering her grandfather with a frying pan. I wonder how she fitted him into it. OK! I’m the Shrimp which sources the vegetables. GOD!! You are one terribly Crosstacean. – Waiter! Old adopted mother’s vegetables just fry the shrimp mushroom. – They particularly must, Madam. In my country, old mother adopted ME! @algermon 0504. Wouldn’t you slip off it? With all that soap, and all. @Yu No Hoo | 4:41 am: That’s because nobody knows where she’s bean. I must pass this one. Offer me grape must instead.